On March 24th it will be proven again that fashion lives in the Nation’s Capital! In 2007, Anwaa Kong had a fashion show that fused music & fashion together and this year he decided to do a revival and collaborate with Harley Morgan, owner of ROE The Agency. These two gentlemen have created a show that will be talked about for some years to come, featuring unforgettable fashions for Spring/Summer 2013 by the area’s top designers and showcasing over 50 models! 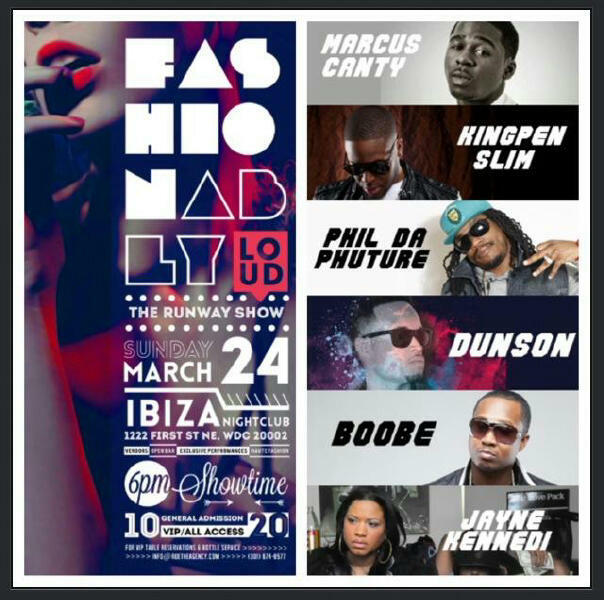 The “Fashionably LOUD” Fashion Show will be Hosted by Autumn Joi, with sounds provided by DJ MIM. LIVE performances will be provided by: Epic Recording Artist Marcus Canty, Kingpen Slim, Dunson, Boobe, Phil Da Phuture, Jayne Kennedi & Devin White. As an added element, there will also be vending by various businesses, such as health & wellness, food, jewelry, clothing + more! “Fashionably LOUD” is also pleased to announce that Sandra Woodley, one of the final twelve selected models for the new Hit series "The Face", currently in rotation on the Oxygen network will be in attendance. Sandra is a well-rounded professional model; as a member of #TeamNaomi, she was exclusively trained by Legendary Supermodel Naomi Campbell, worked on campaigns with Urban Outfitters, Christian Louboutin, Tony Burch, LK Bennett and landed two spots on the hit television show "Project Runway".